One of the big problems for parents is what to do with their little ones during the school holidays. Days out are great, but with the British weather, the chances are limited to experience the great outdoors. However, fear not, for if you pop down to the Theatre Royal Haymarket, you can keep the ankle biters entertained and happy as one of literature’s best-known bunny comes to the West End at the Theatre Royal Haymarket in Where is Peter Rabbit? Beatrix Potter (Joanna Brown) welcomes us to her magical world and, tells us that she has lost Peter Rabbit (Charlotte Harrington). She enlists the help of Jemima Puddle-Duck (Grace Osborn) and, as the two of them search for the errant rabbit, they share some of Beatrix’s stories with us – assisted by the voices of Griff Rhys Jones and Miriam Margolyes. These include the wonderful tale of bitter enemies Tommy Brock (Samuel Knight) and Mr Tod (Matthew Whitby), not to mention Mrs Tiggy-Winkle and Lucie and the tale of Jeremy Fisher trying to get something nutritious to serve his dinner guests. In my very deprived childhood, the works of Beatrix Potter were something that passed me by. Although I have heard of some of the many characters she brought to life, I’ve never actually read one the books. The good thing is that you don’t need to know the stories to appreciate this well put together 60-minute show. With ga great cast, songs by Steven Edis and Alan Ayckbourn and Sheila Carter’s direction and choreography plus the words of Ms Potter, Where is Peter Rabbit? was always going to be a bit of a hit. But add in some amazing puppets, representing not only the various birds and animals but even the young girl Lucie, and we have an amazing show that keeps the children spellbound and gives the adults a chance to re-familiarise themselves with the stories and be held spellbound by the wonderful puppets bringing the stories to life. Whilst all of the puppets are fantastic, I did have my own favourite by the end. 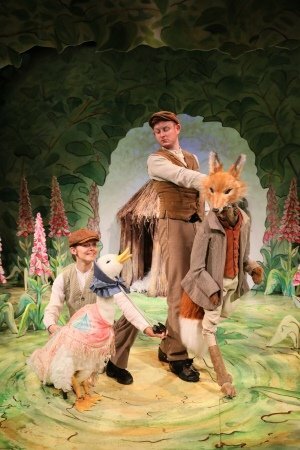 Surprisingly, it was not one of the main puppets but was Kep, a collie on the farm, from The Tale of Jemima Puddle-Duck. I’m not sure why, but the sight of that puppet, followed by some foxhounds, just warmed my heart, and I really wanted to take Kep home with me. Ultimately the test of a show like Where is Peter Rabbit? is the effect it has on its young audience. Well, I can say, based on sitting in an auditorium surrounded by ankle biters, they absolutely loved it. They were transfixed by the goings-on on the stage, and my favourite moment was the gasp of surprise and horror when the giant trout appeared during the Tale of Mr Jeremy Fisher. As an adult, worldly wise and educated, did I enjoy my first dip into the world of Beatrix Potter? You bet I did, and if any of my friends with kids need someone to look after them for a couple of hours during the school holidays, then I know just the place to take them. PERFORMANCE TIMES: Monday, Tuesday, Friday and Sunday: 11am,1pm and 3pm. Wednesday at 11am and Saturday at 12pm.